a Queenly cake! Decorated by my friend Brook Brown! So Beautiful!!! Mix together the sugar, oil and eggs in a large bowl. In another bowl sift together flour, salt, baking powder, baking soda and cinnamon. Add to first mixture and combine. Then add carrots and mix well. Pour into a greased and floured pan (bundt, sheet cake, 9 x 13 pyrex) and bake at 350F until done, 25 (sheet cake) to 50 (Bundt pan) minutes, depending on the pan you use. In larger bowl, cream butter and cream cheese. Add sugar and vanilla and blend, then mix in the nuts. Spread on cooled carrot cake. 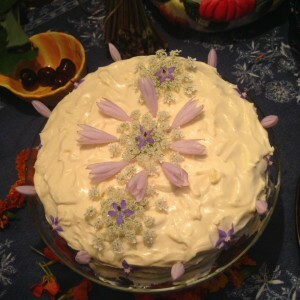 Decorate with edible flowers. Queen Annes Lace is one of my favorite wild edibles. The flowers are mostly what I like to consume. The root however is a carrot. Being a biennial it needs to be harvested in the first year when it is still tender and carroty. The second year, the energy has shot up the hairy legs of the Queen and is busy making flowers and seeds, thus the root is woody and not edible or palatable.